Can you guess what made us a wee bit nervous? Getting onstage in front of 2,000 people to talk not about one of our successes — but about one of our biggest failures. 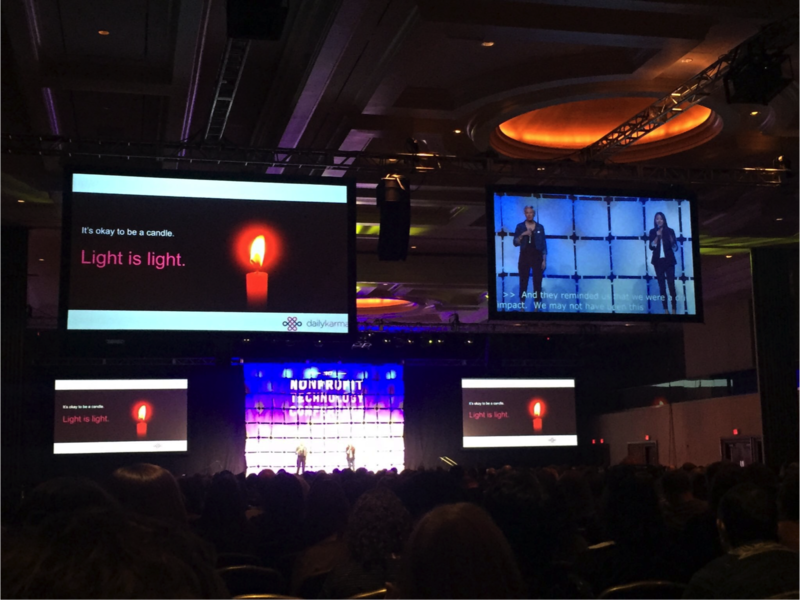 Mel, our VP of Marketing, and I were honored to deliver an Ignite Talk on the main stage at NTEN, the largest nonprofit tech conference, held this year in Washington D.C.
We talked about how we learned the art of perspective through our journey of building dailyKARMA, and how failure isn’t just a dead end. It’s an opportunity. Since that talk, and since our app has taught us a thing or two about giving back, we’ve been working hard to prepare a brand new product for you. Stay tuned — it’s coming in just a few weeks! About Patty Dao: Patricia Dao is CEO at dailyKARMA. She is a long time advocate of women’s education and entrepreneurial endeavors in STEM fields. She loves building things, especially lego fortresses with her daughter. Reach her at patricia.dao@dailykarma.com.